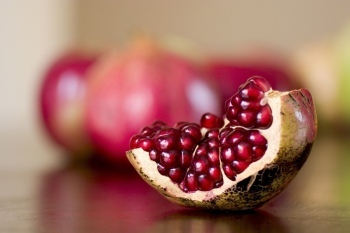 Health Benefits of Pomegranate Juice: Four Incredible Reasons to Drink Up! Did you learn the health benefits of pomegranate juice as a kid? As children, every adult is told that in order to grow up to be strong and healthy that they must eat their fruits and vegetables. Children tend to rebel against their parents commands, until they began to age and realize that a lot of the foods that their parents suggested that they eat were good for them. Recent studies show that the health benefits of pomegranate juice are massive and can benefit both adults and children. A study done in 2004 that was published in a major nutrition journal found that patients who suffered from severe artery blockages benefited from consuming one ounce of pomegranate juice every day for an entire year. The individuals that were on this type of year long regimen saw a twenty percent decrease in their blood pressure, and a thirty percent decrease in the amount of plaque that was blocking their arteries. In a 2005 study, pomegranate compounds appeared to slow the natural deterioration of human cartilage-which causes arthritis. A later animal study that was published in 2009 revealed that the same pomegranate compounds inhibited the human body's natural inflammatory response to osteoarthritis. Research has shown that pomegranates along with their juice have the ability to slow down the growth of cancer cells in a human's prostate and lung region. Even though pomegranate cannot cure cancer completely, it can definitely help stop its progression. Pomegranate juice contains more antioxidants than orange juice, red wine, blueberry juice and acai berry juice combined. Consuming the juice that is produced by pomegranates may halt the progression of Alzheimer's disease in patients that are plagued by the disorder. No human studies have been conducted to show the effects of the juice, but studies have been carried out in mice in a laboratory setting. The studies showed that the mice that were given the juice were thirty five percent faster when it came to navigating through a maze. The mice also had more than fifty percent fewer brain deposits. Studies reveal that the health benefits of pomegranate juice are significant. For the people that have not had the pleasure of trying the juice, it is suggested that you give it a shot. It tastes fairly similar to cranberry juice, except it's a little bit sweeter. Eating a full pomegranate can be difficult to do. The fruit naturally has a thick skin and hundreds of small seeds inside of it. Drinking the juice from the fruit is an easy and healthy way to consume the fruit.